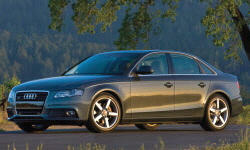 Why the 2012 Audi A4? Very surprised! Drive 80 Hwy / 20 City driving. If I watch how I accelerate (cruising speed not so much; I drive 110-125 on hwy). Averaging 6-7.5L/100km. (700+km per 55L tank every fill up). Under rated numbers. It feels faster than the 211HP advertised. But there is notable turbo lag under 2500-3000RPM. 245/40/18 OEM GoodYear Eagle PS/2. Heard horrible stories about them. But at that width, that thing grips quite well for every day driving. Never break traction in my experience. Pleasantly surprised about Base audio. I can appreciate good audio. It's not as good as the Mark/Levinson on the 2004 RX330. But easily as good as Bose Unit in 2000 Nissans, and better than JBL on Camry. Why Not the 2012 Audi A4? Comparing available options in the US and Europe. You can't get Nav or upgraded B/O audio unless you have the most expensive model. Back up camera is not available. Sport package has to be special ordered ($500 extra fee). Like German cars, the seats are quite hard.